"The man and his golden voice"
From the peppy "Aao twist karein" to the folksy "Chunri sambhal gori". From the heart-tugging "Ae mere pyare watan" to the comical "Ek Chatur naar". Versatility has another name. Manna Dey. His haunting voice is ever magical. Lovers of old Hindi and Bengali film songs would immediately recognize his distinct style that won him fans the world over. 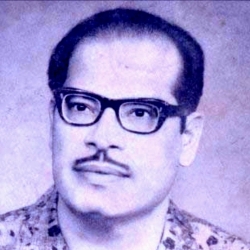 Manna Dey was born as Prabodh Chandra Dey in Kolkata and was introduced to the wonderful world of music by his uncle Sangeetacharya Krishna Chandra Dey. He took the young Manna Dey with him to Mumbai and made him his assistant music director. Soon he was working with the legendary S.D Burman, as his assistant. He continued his passion for singing by taking lessons from Aman Ali Khan and Ustad Abdul Rahman Khan. His singing career kick-started in 1942 with a duet with Suraiya "Jago Aayee Usha Ponchi Boley Jago" for the movie Tamanna. It was an instant hit. There was no stopping Dey after that. He was one of the most prominent playback singers between 1953 to 1976. He was the charming voice behind Raj Kapoor's goofy numbers and sang evergreen hits in Shree 420 and Mera Naam Joker, to name a few. He also sang in 13 other languages. He is the recipient of the Padma Shri, Padma Bhushan and the prestigious Dadasaheb Phalke Award. SoulPrints salutes this modest maestro and his wonderful contribution to the Indian music industry.